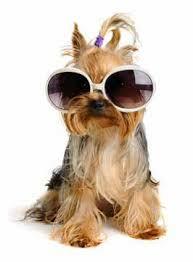 For pets that go to the grooming salon, most visits are uneventful and result in a clean and styled pet. Sometimes, however, things don’t go as planned. Here are some of the most common problems reported following professional grooming. The first type of problem is when the grooming style or length is not what the client expected. Sometimes this is due to non-specific or unclear communication between client and groomer, but more frequently it is because the groomer cannot perform what the client prefers. A pet’s condition and/or behavior may mean that the groomer is unable to leave the requested length, or trim exactly as instructed. 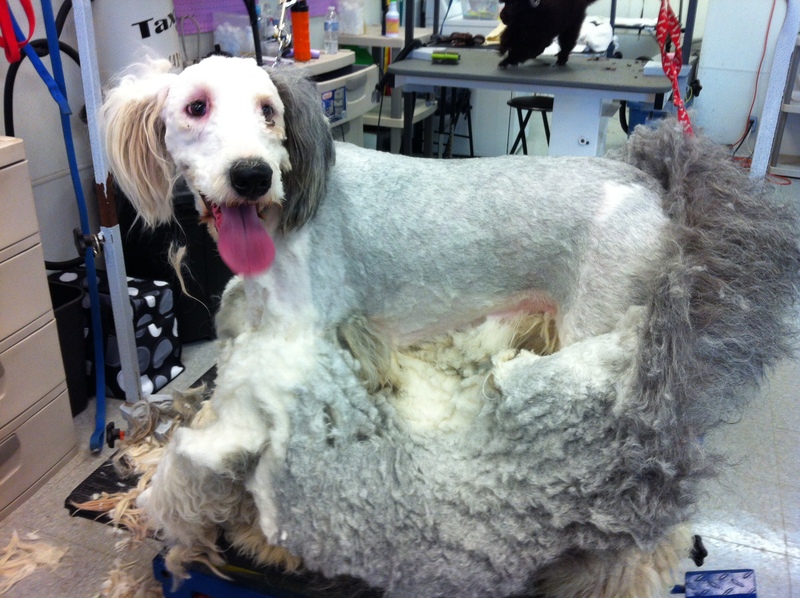 Quite frequently, a client will request a longer style, only for the groomer to find significant matting underneath. Unfortunately, it is painful and potentially harmful to demat a pet, so when the matting is too extensive or in certain locations the only reasonable, safe, and humane choice is to clip it short and start over. Occasionally a groomer will find a problem as they begin the grooming process, and will need to modify the style due to the underlying issue. In the first photo, you can see how the hair is tightly woven together underneath. There is no humane way other than clipping short to remove this kind of pelt. Pets with this kind of matting typically must be completely shaved. 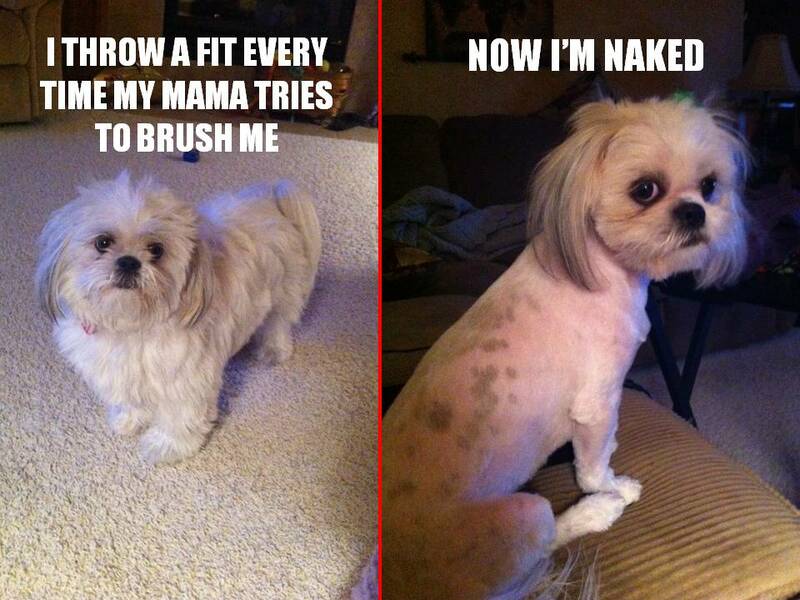 Sometimes it is the behavior of the pet that means that grooming cannot be completed as preferred. If the pet will not tolerate brushing, or doesn’t like certain areas touched, it will be very difficult for the groomer to achieve the ideal finish. In severe cases, it may be necessary to work with a veterinarian or a behaviorist to get the job done safely for groomer and pet. Another issue occurs when the pet has a reaction of some sort to a product or tool used. Some pets are more sensitive than others to certain types of shampoo ingredients, or fragrances. Others may become irritated after clipping, especially in areas taken short, and irritation is even more likely when shorter blades must be used to remove matted hair. Bruising and skin rashes can occur when a pet is dematted, as there can be trauma to the skin not only from the tools but from the pulling on the skin. “Clipper” or “razor” burn is not typically from a hot blade, but more often from close clipping which can be irritating for some pets. Brush burn or irritation can also occur if vigorous and/or repeated brushing is necessary to get through thick or tangled areas. In this photo, you can see the irritated skin in an area that was clipped short. If the pet does not leave the irritated area alone, it can quickly become worse, perhaps even requiring veterinary treatment. Keeping pets from licking or scratching the affected area is the most important aspect of treatment for skin irritation. 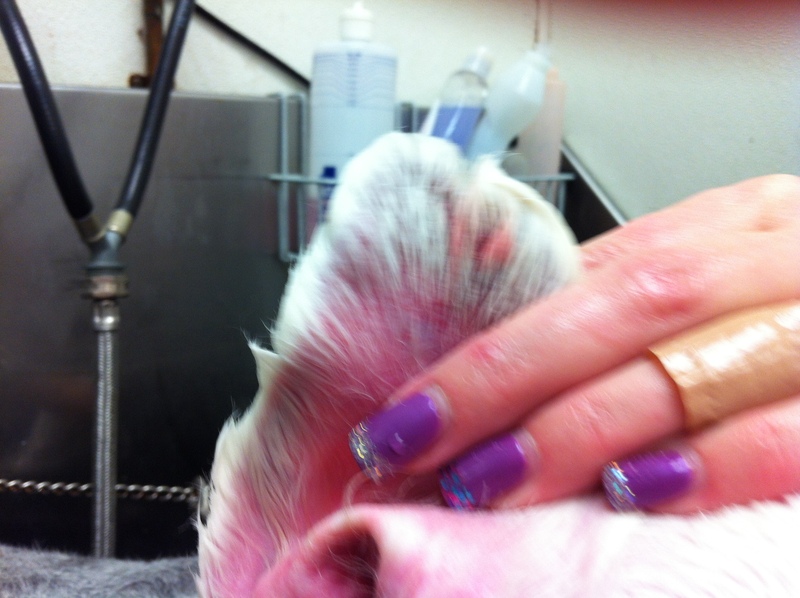 This photo shows the beginning of an ear hematoma, which was caused when the matted hair that had been pulling tightly against the skin was removed. The blood rushes back into the ear, and it feels funny to the pet, who often then begins shaking the head and/or scratching at the ear. Blood pools at the tip, and seeps out through the skin. The best way to prevent this type of injury is to make sure that the pet does not get matted to the point where it has to be shaved. 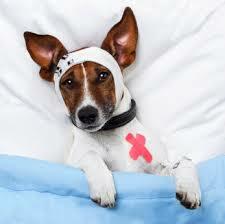 The most upsetting problem for pet, client, and groomer is when a pet is injured during the grooming process. While most injuries are minor, and do not require veterinary attention, it is possible that more serious injuries can occur- after all- groomers are working with live and often unpredictable animals and using sharp tools! Injuries can range from a toenail trimmed too short, to a small nick or scrape, to injuries requiring veterinary treatment. 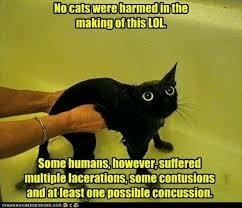 Some pets can injure themselves when fighting against restraints, or objecting to parts of the grooming routine. 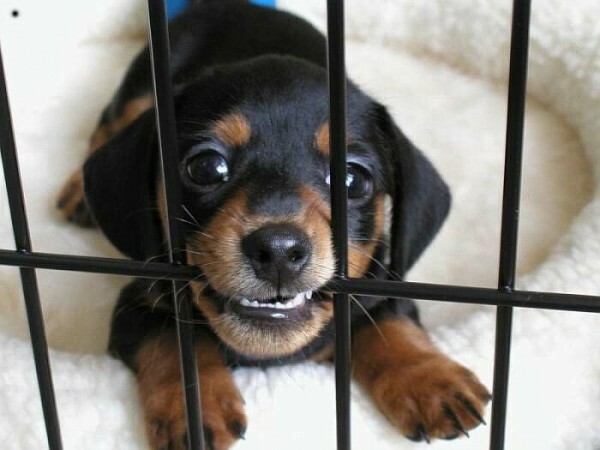 Other pets may be anxious, or not like being confined, and injure themselves in a holding crate. Groomers should be able to administer appropriate first aid, and also communicate to the client how and where the injury occurred. 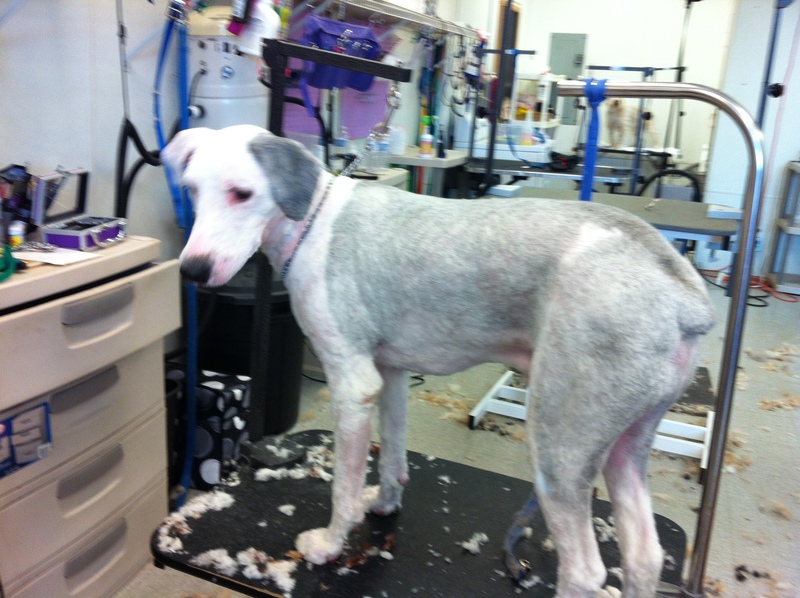 So what are the ways that groomer and client can help to ensure that grooming goes right? On the groomer’s side, making sure that equipment is safe and in good repair is the first step. Choosing safe and effective products, understanding how they work, and selecting the right products for a particular pet is also crucial. Knowing proper handling techniques, especially with difficult dogs, also helps to minimize the risk of accident or injury. A groomer must also be able to evaluate whether or not continuing on a particular pet would be indicated or if complications are likely to result. On the client’s part, bringing the pet in regularly, and in decent condition, makes it much easier to achieve the look they want. Communicating any special needs or concerns regarding your pet is also very helpful- if the groomer knows that the pet has had trouble in the past with a product reaction, irritation, or doesn’t like to be handled in a certain way then he/she can make choices to again minimize the risk of any problems. And last, understand that if the groomer is telling you that something is not possible, or safe, believe them! Groomers want satisfied clients, and will generally do their best to accommodate what the client wants, but it simply is not possible in every circumstance. The last thing any professional groomer wants to do is injure a pet, or displease a client. Working together means that everyone wins- groomer, client, and most of all- the pet!